Did you know that earwax buildup in older ears can pose serious problems for over 2 million people that live in nursing homes? It’s no wonder that as people clean their ears if they notice a different color they want to make sure it’s not a serious issue. Can you get an overview of your health by looking at your ear wax color? Yes, you can. Keep reading to learn what each color means. Believe it or not, you can learn a lot about your health from your ear wax color. Some people might think it sounds gross but your ear wax does a lot to protect you, and it should be appreciated more. It’s important to keep our ears healthy and ear wax is a major part of this process. Ear wax helps dirt and debris from entering the ear canal. Some people don’t realize that our ears help prevent infections from starting and they also have the ability to self-clean. Old ear wax and dead skin cells move from the inside of the ear to the ear opening and fall out. It’s important to keep stress levels under control because it can cause overproduction of ear wax. If there’s an overproduction and the ear wax doesn’t get forced out it can cause a blockage in the ear. Normal ear wax is typically an orange-brown color. If you notice your ear wax coming out with a yellowish-greenish color it can be a sign of infection. If this is ever the case make a doctors appointment to check your ears and take care of them as soon as possible instead of putting it off. Green usually means infection but if it’s green and watery it can also mean that you’ve been sweating. When you sweat the water mixes with the ear wax and changes the color and the ear wax texture. If you have an infection then the body’s response to invading organisms changes the color. The response or defense mechanism can create pus which mixes with the ear wax and changes its color. 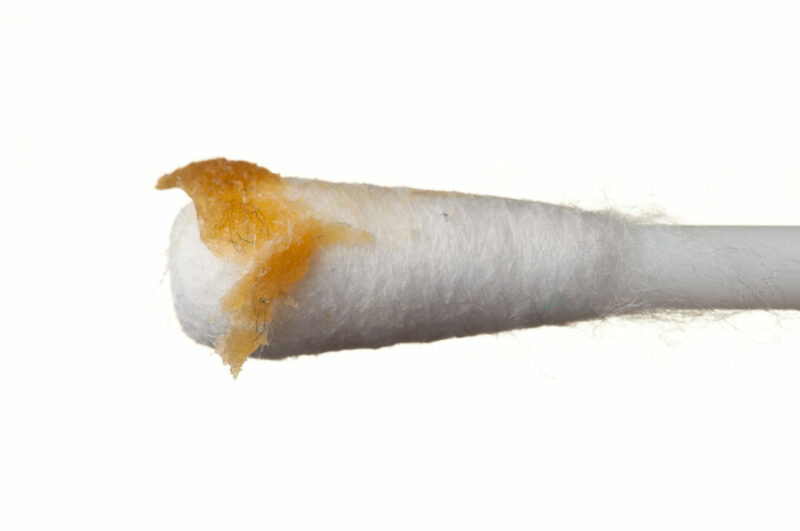 Ear wax that’s white and flaky is another common type of wax found in ears. It’s been linked to people who produce less body odor. Sometimes people think flaky ear wax means they have an infection but it’s not typically the case. It’s something that happens as you age because the body gets drier and the glands that produce ear wax also get drier. If you’re experiencing itchiness in your ear you can add a few drops of mineral oil to the ear canal. This will help ease itchy ears and any discomfort from flaky ear wax. If your ear wax is darker and sticky than most it means that you have a chemical in your sweat that produces more body odor. Dark and sticky means that your body releases more sweat than others. This is a common ear wax color found in people ears. When the wax is yellow and sticky it’s able to lubricate the ear canal. If the ear canal is lubricated it prevents the ears from getting dry and itchy. Black ear wax is one of the most alarming types of ear wax for people. Even though it looks scary it probably isn’t a reason to get nervous. It might be a sign that you have too much stress and your ears have been overproducing ear wax. It can also be a sign that the wax has been in your ear for a while. When the fats found in ear wax come into contact with oxygen it causes the wax to darken. If the wax is in the canal for a long period of time before coming out, it’s exposed to more oxygen making it darker over time. Gray wax might look unusual but it’s probably a sign of dust buildup. Gray shows that the ear wax has been doing its job of protecting the eardrum from anything foreign such as dust from entering the ear canal. If the gray wax is also dry and itchy or it’s cracking inside the ear canal you will want to have a doctor check it out. It could be seborrheic eczema which can get very itchy and uncomfortable at times if you don’t treat it. Ear wax shouldn’t have an odor. If you’re experiencing stinky, smelly ear wax it’s a sign of infection. This is something you want to go have a doctor check out because it can also mean your eardrum ruptured. Don’t ignore smelly ear wax, because bacteria that doesn’t need oxygen in order to survive gives a stinky odor that in turn makes the ear wax smelly. Some signs to look out for are, feeling off balance or hearing a ringing noise inside your ear. The smelly odor can mean that there’s an infection that’s causing damage in the middle of your ear. Now that you have read different ear wax colors and what they can mean for your health you might be feeling like an expert. It’s important to know the difference and understand when a certain ear wax color means a trip to the doctor. Ear wax comes in different texture and colors and it’s important to take care of our ears. Are you ready to learn more about how to maintain healthy ears and hearing loss? Check out our blog with more articles.